Much debate has recently arisen in regard to the use of Round Pens and the practices or methods that incorporate them. Round pens are labeled as torture devices by some and a place to create a friendly atmosphere for training, by others. The debate is wonderful in the sense that both sides boil down to an attempt at attaining a healthier, safer, and friendlier environment, which in turn leads to a more profitable relationship. These debates lead to studies which help guide our understanding, and lead us to question practices, methods and even whole thinking habits. In reality all methods can be improved in so much that new light is shed on species specific behaviors’, individual variation and the application of appropriate Learning Theory. Horses and people have been around each other for donkeys’ years and a wealth of knowledge has been passed on through the years, but many observations have not always been easy to convey. As Konrad Lorenz (1935) put it; ‘Language itself forces us to use terms borrowed from our own experience’, thus objectivity is not as simple as it first seems and many have described their experience in terms familiar with them at the time. Greater consensus may lie in clearer definitions of terms and concepts generally used in the horse-world, as elsewhere. Efforts in this direction should be embraced and enhanced, so we can ultimately not only talk the same things but use more effective language. One of the underlying questions in the round penning techniques is welfare! 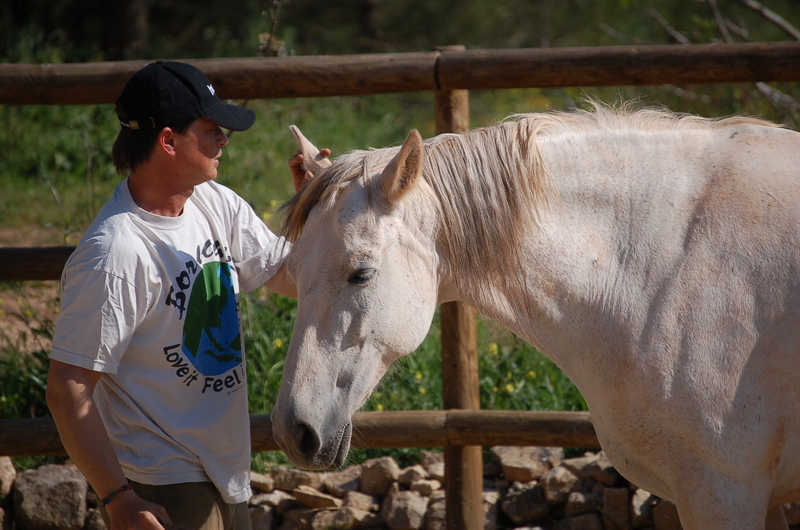 Horses cannot escape aversive stimuli, unavoidably leading to stress and other states such as helplessness. Many times this stress is provoked with the apparent function of establishing who is boss in the dyadic encounter. See the Long Riders Guild (LRG) webpage for comments on round pen training from known scientists. Horses move away from agonistic encounters and other appeasement gestures are not known in the behavioural repertoire of horses. It would be biologically unwise to submit to other animals that are being predatory or threatening, and it seems in the end we are waiting for something that does not actually happen. Many terms such as respect, acceptance or obedience are subjective and confer a higher faculty to horses, as dominance and submission clearly infer the existence of individual recognition. In my opinion the indirect inference of higher faculties and individual recognition in horses is the only vantage point in these types of considerations. Their sentience and conscience is no longer in question, ours may well be! Although knowing that we generally use aversives to stimulate responses in horses, this does not necessarily have to be negative, or a harmful experience. However, it may be beneficial to bear in mind the added effect which our agonistic intention may have in the learning/relational process. We may consider other interesting ways in which horses resolve their encounters. Borrowing from the inference of individual recognition, there are also affiliative behaviors’ to consider in social relationships, be it interspecific or intraspecific. Text books or published studies have focused mainly on agonistic encounters, and how social species organize themselves through dominance hierarchies. Few texts actually mention affiliative behaviours’ such as those creating bonds and ties between individuals. Many social species live in breeding units, or families, and have more behaviours’ that strengthen bonds than those that weaken them, but little attention has been given to this category of behaviour. Familiarity, friendship, trust or confidence are words currently in use in the horse world, albeit more so in the natural horsemanship world. The same people that use obedience and respect freely are terrified to use the word friendship or confidence, silly isn`t it? The barrage of critique received by round penning methods may be useful in underlying some of the limitations imposed by different ways of thinking and relating to horses. Heavy critique has also fallen on Equine Sports in general, mainly by Natural horsemanship movements, so I can only hope this is not just some infantile retaliation. Hall C, Goodwin D, Heleski C, Randle H, Waran N. (2008) Is there evidence of learned helplessness in horses? Journal of Applied Animal Welfare Science. 2008;11(3):249-66. I think a round pen can be used to build a relationship, not force a relationship. Sending an animal away in a round pen where it has nowhere to go, risks becoming abusive. Having an animal in a space where you can interact without it just wandering off, or finding something to eat, can be positive. ie you use the boredom factor, “there’s nothing to do, nothing to eat, let’s see if this human is doing anything interesting” can be useful. I agree, round pens can be very useful and I will surely continue to use them. Round penning, which are techniques used in the round pen are many times questionable, In the end of the day relying on aversive training and restricting possible flight reactions whether in the round pen, a square one, or even just on the lead rope may inevitaby lead to undesirable behaviour, which in turn leads to safety and possibly welfare issues.